Learn to hammer trout with dry fly techniques will require some work! Learn to hammer trout with dry fly techniques is a very enjoyable method to catch trout. Most of the masses in my part of the country tend to neglect fishing the surface. Tight lining with nymphs is no doubt a very productive technique overall. It can put up countless numbers of fish to the net. I started my kids at 3 years old because it is simple and offers a high level of control. Many start there and never move on to the next level of control because it works. It is easy and fits well with the “cookie cutter” approach of instant gratification to fish only a rod length away on heavily stocked waters for trout raised in concrete hatchery runs. It’s time to move on, time to get going (lyric’s from the late Tom Petty). I do believe that the set of challenges getting drifts dry fly fishing are a natural progression. The action of watching a fish feed in the film is exciting! Developing the skill set to actually make the fish eat will require some work for success. Centuries have had prideful anglers and literature going and back and forth with elitist attitudes on techniques. This is not an attempt to bring back the Halford and Skues debate on nymphs versus dries. This is about getting folks motivated to push ahead! Keep learning! Do not get complacent because you can tight line a few fresh trout from the hatchery under your rod tip! Plod ahead for your fly fishing journey! There are plenty of combat fly flingers today that skillfully lob bobbers very short distances. If that is what appeals to you then this piece is probably not for you. I believe strongly that the journey of fly fishing includes all of the techniques (wets, nymphs, dries, and streamers) for becoming a well-rounded angler. They all have nuances of adjusting the cast itself for attempting the desired outcome. Many of the problems fly fishers face globally is the regression of concepts that simply put have set us back over the past few decades more than ever before. There is no doubt in my mind that there is a global army of very passionate teachers that take this very seriously for teaching others. One of the biggest challenges for raising the bar come from many (some iconic) figures that still are holding it back. Bad information laid down incorrectly for the “perfect practice” sessions. If we build the foundation casting grail on incorrect assumptions then it becomes difficult to abandon them over time. They become your default-hence the problem. Think about that for a second! I think part of this is also due to tradition has always addressed casting as this waving 10-2 vertical stroke as the grail of the sport. It instills the wrong foundation because it becomes default! We can teach PULD cast (tradition) in under a few minutes. If that is all you go away with then you are not even in the game for the problems on the water. So, the objective of you the caster has to break away quick from the goal being just to get it out there! The goal now becomes get it out there with the proper layout! Most folks assume they are progressing with their casting once they can make it go! This is the wrong approach and will not lead you to the presentations you desire in the long run. You must commit to maximizing your journey of this great sport. That translates to actually practicing off and on the water! You are well on your way to dry fly fishing when you can hit curves left and right or pile from all rod planes and loop planes in practice. It will empower you to have what is meant by excellent “presentation” matching obstacles and water current to actually enjoy your time on the water. The other benefit is you will rarely be stuck in foliage or practicing knots all day long on the water! I have been blessed the past few decades with dedicated clients taking the journey that actually repeat 8-10 times per year. I have little use for what I call the “combat fishing trips” with folks that do not want to learn about the sport. These folks tend to be content catching a few trout by lobbing a bobber all day 10 feet away. The sad thing is they have no interest in improving and that is the reason I look elsewhere for filling the calendar teaching. How can you teach when they have no incentive to learn? Everyone understands what is meant by a bell shape curve. Do you want to remain in the middle of that curve more concerned on just getting it out there? Do you want to commit to learning enough about the sport where you can enjoy it all over the globe solving problems? The really accomplished mentors I have all over the globe are only concerned being far out on the edges of the curve. They constantly strive to better their understanding as well as there skill level. They seek new boundaries and share this with others. There have always been two kinds of anglers in the sport. Those that take information and regurgitate it like they invented it (me, me, I wanna be icons). Other inventors that truly want to share with others the foundation that empowers others to be great. Most of my casting geek friends that really want to change the sport for the better are all throughout Europe and Oceania countries. A handful of guys here in America are also part of this global movement in fly casting today. We have better fly lines, fly rods, mono, and even flies than ever before here in America. We also have this massive regression of competency for the number of fly fishers I see visiting my region of the country or visiting the famous rivers of the west. What is the solution to push forward? Why do so many retailers constantly advertise “fly fishing is so easy” going so far as offering free casting lessons? The big chain branding (without mentioning names) are directly responsible for the overall regression. I have always been an avid follower of Bob Dylan because of his brilliant ability as a wordsmith. Some of the most important words ever written reflect his crafty use of language. The lyrics to the “Times they are a Changing” can just as easily be applied to set your bar high for the journey of becoming a very efficient fly fisher. I highlight the last few lines of the song that apply to the fly fisher. Come mothers and fathers Throughout the land; And don’t criticize What you can’t understand; Your sons and your daughters Are beyond your command; Your old road is rapidly agin’; Please get out of the new one if you can’t lend your hand; For the times they are a-changin’. The line it is drawn The curse it is cast; The slow one now Will later be fast; As the present now Will later be past; The order is rapidly fadin’ And the first one now will later be last, For the times they are a-changin’. Smooth your fly cast out to deliver s—-l—-o—-w! Dry fly fishing is about finesse and casts that solve difficult circumstances. When teaching, many tell me they are advanced fly fishers. Their deliveries are too quick often which makes it difficult to find their dry flies on the water because turnover is very quick. Learn the opposite and you will enjoy it! Observation from teaching three and half decades tells me that this is the number one problem for those embarking on the journey of fishing the surface. Also, slow down with your approaches. How many times do I get folks that observe more than fly line flinging back and forth? Look more and cast less. You will generate more strikes because then you have a goal to present your fly. You can also pick out the singular fish you want to catch! Dry fly fishing is not about whipping the line back and forth. In fact, most of your casting strokes should attempt to be all about setup move, followed by a delivery cast. Delivery is usually one of three methods, curve casts right and left, or a pile casts. On the rare occasion, we may target a rising fish with a straight cast but it is not as common as the first three mentioned. Winter fishing offers excellent small dry fly fishing with BWO hatches and midges. The best method for working a fly in these conditions is to rest after netting a fish to let the pod of fish continue on with the feeding frenzy. Fish are alerted each time you hook up. Beginners tend to throw right back into the pod after having a hookup. This reckless method is a sure-fire technique for putting them down in a hurry. Fish are very in tune with their surroundings. Small fish make a much greater disturbance on the water when taking your fly. 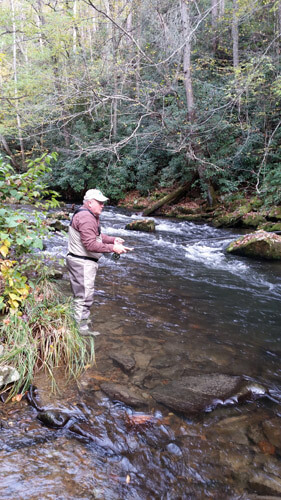 Really good dry fly anglers, like my friend Jim Estes from Bryson City, taught me over three decades ago to differentiate the quality of fish by the manner in which it strikes. The greater quality trout that you want to catch have the dry just sink with very little disturbance on the surface. Set the hook! It does take a great deal of time actually fishing to learn this. Relax and do not be overly trigger happy about hook setting everything that strikes! This discipline takes many years to implement but you can make it one of your goals. The reason it enables you to see much greater quality fish is that it does not disturb the water! Everyone wants to catch the quality BIG trout. Very few have developed the skill-set to do that with any consistency. These subtle observations from teaching three and a half decades of techniques and casting have taught me that these are the main things to correct for the masses. You will jump ahead of the curve with implementing them for your time on the water.